I'm playing along in a card challenge today. Yes, finally! 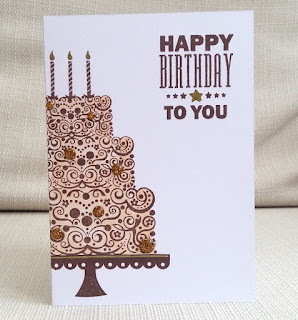 It's the City Crafter Challenge Blog Birthday CASE #4 (week 359) and we're casing a beautiful card created by Marina. It's so feminine and pretty, isn't it? I immediately thought of lace when I looked at the cake image on Marina's card. So that's the direction I took, as you'll see below. Marina's colors are soft and subtle, but I decided to go a bit bolder with my color choices. This card has lots of dimension! I cut white card stock for each of the cake layers; covered each with teal felt, then over that I wrapped lace and ribbon trim. The cake "plate" is a piece of gold foil paper. After stamping the candle flame I added some Stickles to give it a little sparkle and shine. It was fun to finally get back to my blog and play along with a challenge. Well, this is astounding! Thank you for your kind words- I'm so flattered you cased my card and your twist is original and beautiful. Love the lace and the bold colour scheme.Thanks for joining in at City Crafter. ooh, the lace was an amazing choice, your card is so so beautiful Susie! Oh this is pretty and a terrific take on Marina's card!! Thanks so much for playing along at CCCB!! Such a pretty card! I love your textures and colors! You just nailed Marina's card. The perfect CASE! Thanks so much for joining us at CCCB!